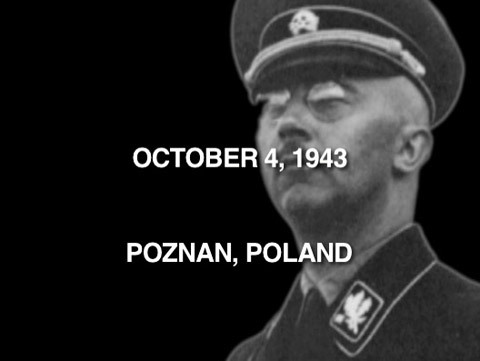 On October 4, 1943, Reischsführer-SS Heinrich Himmler gave a speech to a secret meeting of SS officers, in Poznan, Poland. In this speech, he spoke frankly about the ongoing extermination of the Jewish people. This is one of the most chilling documents of the Holocaust. The Holocaust History Project has prepared an audiovisual presentation, in QuickTime movie format. The text of the original German and translated English is displayed as the audio record plays. That movie, and this accompanying background information, is made available for students, researchers, or anyone interested in this historic document. You may be interested to read our biography of Heinrich Himmler. You may also read the full text of the speech, in English and German. Questions about our translation? Holocaust-deniers have tried to evade the meaning of this speech by imaginative interpretations. We offer commentary on Himmler's speech and "ausrotten". If your computer can't play the movie, download QuickTime here. The movie begins with with a brief (40-second) introduction giving some background for the speech. Himmler was speaking from his notes, in a private session to SS officers in occupied Poland. Of the three-hour speech, only the five and a half minutes presented in this movie concerns the destruction of the Jews. The German and English text scrolls by as Himmler speaks, so English speakers can understand his meaning. 1. Some want to make exceptions for "good Jews"
Going strictly by the text, Himmler's point in mentioning the then-ongoing Holocaust was clear. He was encouraging his officers, whose men were perpetrating the murders, to enforce a policy of zero-tolerance of stealing from the victims. Along the way, he emphasized the importance of both secrecy and ruthlessness in this operation. But there is a subtext here, too. By describing this operation openly before this closed session, Himmler ensured that his audience was implicated in the crimes as well. It is a well-understood technique of persuasion to spread around guilt. Just as gangs are said to force new members to commit a serious crime, Himmler was making sure that everyone listening knew they were all in it together. The importance of that bond is evident from his frequent references to secrecy, and the distinctions between "us" (decent, hard, glorious, with a self-evident "tact" for keeping secrets) and "them" (the unworthy SS men, sick, failed, and executed). It is also questionable whether "most" of those officers present had seen 100, 500 or 1000 victims' corpses. Whether that statement was true or not, anyone listening who had not taken part in the killing would be made to feel in the minority, and thus, Himmler probably hoped, less likely to speak out about the horrors that were being perpetrated. was the Polish name for the town where the meeting was held. Posen was the name the Germans gave it when, in 1939, they invaded and took over the western half of what is now Poland. Both names are correct. June 30: Everyone listening at the time would have known that "June 30" referred to "The Night of the Long Knives" in 1934. On that date, Hitler ordered the arrest and execution of Ernst Roehm, the leader of the SA, and at least 77 of his fellow "traitors," because he was afraid Roehm would try to lead that organization against the Nazi government. Himmler is here comparing the difficult task of purging the Nazi Party of a perceived traitor to the mass murder of millions of Jews. Either way, he is saying, an officer or a soldier must do as he is commanded, and keep silent. Aus...schaltung: As Himmler mocks Germans who treat the extermination too lightly, he mimics them saying "Aus...schaltung der Juden, Ausrottung, machen wir" ("elimination of the Jews, extermination, is what we're doing"). His hesitation in the middle of the word "Ausschaltung" ("elimination") seems to be a quick mental verification that it is okay to use both words, since he is speaking in private. This is reminiscent of a moment in the famous, and very public, "total war" speech by Joseph Goebbels in the Berlin Sportpalast on February 18, 1943, where he began to say "Ausrottung des Judentums" ("extermination of Jewry") but quickly switched to "Ausschaltung." The result, which can be heard in this brief MP3, was something like "Ausrott...schaltung des Judentums" ("exterm...elimination of Jewry"). A laugh? After Himmler makes his sarcastic remark about some Germans thinking they know a "first-class Jew," one can hear what sounds like a laugh from the audience. A few moments later, there is a similar sound. In our opinion, it is difficult to determine either sound with certainty. It might also be a cough (by Himmler or from the audience), or perhaps something near the microphone being moved. The timing is unfortunate, however, and at least the first noise certainly sounds like a laugh. "[judged]": German verbs appear at the ends of sentences, and when spoken sentences get too complex, sometimes verbs get left off. Himmler never actually says the verb in this sentence. His intended meaning, however, is obvious. The speech was recorded either on phonograph-style discs or on tape. Richard Breitman writes (in The Architect of Genocide , 1991, p. 242) that "red oxide tape" was used by Himmler later in the war. But Breitman's source for this information is not given. most of the original recordings had been made with pairs of disc recording machines... all of the material was re-recorded on tape. There is a faint before-and-after echo that can be heard at loud portions of the speech, most notably when Himmler shouts "gnadenlos" ("mercilessly"). This is from the magnetic impressions bleeding through two or three layers of tape on a reel, and indicates that a source for our recording spent some years on tape. Whether that is Himmler's original tape or the National Archives' master tape made in the 1970s is, at this time, unknown. 12. Himmler, Heinrich. "Speech to the SS Officers" ("Rede zu den SS Fuhrern"). Posen, Oct. 4, 1943. Approx. 190 min. Item 242-256, 242-259, 242-257, 242-251, 242-252, 242-249, 242-264, 242-263, 242-250, 242-266, 242-180. The speech has been published in IMT, Trial of the Major War Criminals (Nuernberg, 1947-49), vol. 29, p. 110-173. Copies of this recording can be ordered by writing to the National Archives in College Park, Maryland. Note to researchers: as of this writing (March 2004), not all of Record Group 242 is searchable online. Do you have questions about the Himmler speech, our QuickTime presentation of it, or the commentary on this webpage? Please feel free to email us.